The combination of the abundance of cabbage this time of year, the mouth-watering suggestions tweeted by FarmhouseKraut, and the fact that I received a brand new 2.75 liter Marmite for Christmas has inspired some pretty steady DIY Sauerkraut production in my household. I've made a few batches so far this year, each time experimenting with new ingredients and the length of fermentation. Sauerkraut is amazingly simple to make. At its most basic, Kraut requires minimal ingredients (cabbage and salt) and can be used in a variety of ways (favorite suggestions include kraut and tuna sandwiches, bloody marys spiked with kraut juice, and Choucroute de Poisson). Cabbage- the amount depends on your fermentation vessel. I used 4 cabbage heads for my 2.75 liter marmite. 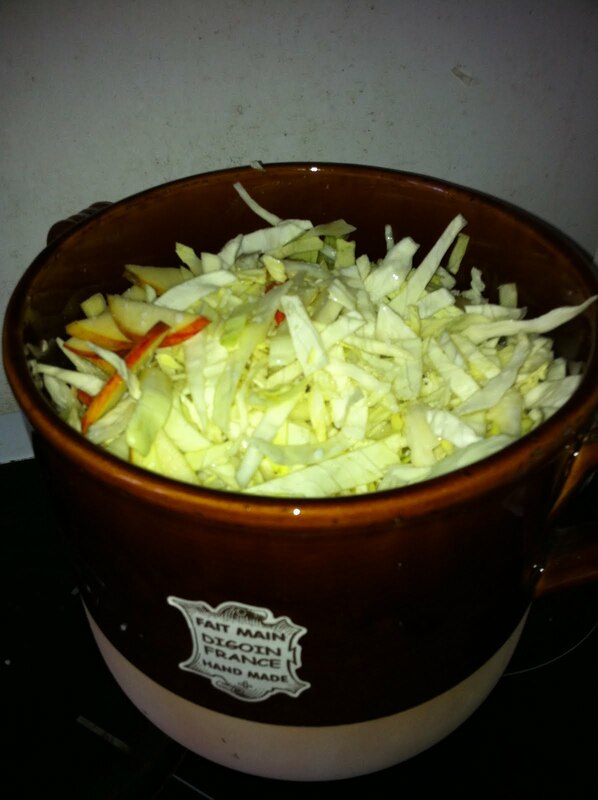 Keep in mind that the cabbage will reduce greatly in size as it secretes its juices and ferments, so you can really fill up whatever crock you're fermenting in. Sea Salt- 3 tbsps for every 5 lbs (2.2 kilos) of cabbage. Optional: apples, radishes, different types of cabbage, juniper berries, whatever you think might work. 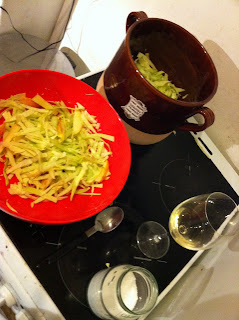 It's also nice to drink a glass (or two) of white wine during the process. For those of you who like cooked kraut, you can bring the whole thing full circle later when you heat it up with a cup or so of white wine. Step 1: You can either chop your cabbage by hand or use an electric grater to get really finely shredded cabbage. I slice it by hand because it's easy and I like a chunkier kraut. Step 2: As you chop your cabbage, throw it in a bowl and sprinkle it with salt as you go. Introduce your fruit or other veggies into this process. Adding the salt gets the cabbage and oter additions to release their liquids, which make up the brine that your kraut will ferment in. Step 3: Once you've chopped all your kraut ingredients and added all the salt, spend some time hand mixing it all up and getting some of the juices flowing. You can rub the salt in more and keep at it until your mixture gets a little liquidy. Step 4: Put the cabbage, salt, etc. mixture into your crock/glass jar/fermenting container, packing it down really hard as you go. Packing the cabbage will get it to release more and more liquid. Step 5: Add your weight to the crock so the kraut is submerged in its brine. I place a plate on the cabbage and weigh it down with glass jars filled with water. Step 6: Don't worry if you're kraut isn't super briney to begin with, it can take about 24 hours to get enough brine for the kraut to be submerged in. I usually make my kraut in the morning or afternoon so that I can periodically apply more pressure to the weights throughout the day. 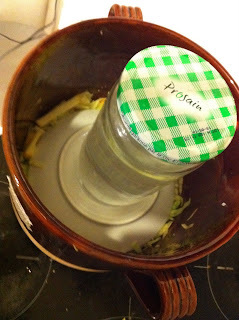 Do this whenever you walk by your Kraut and once there's enough brine, you can just let fermentation do its thing. I didn't grow up on kraut and the taste is pretty new (and strong) to me, so for now I'm stopping my kraut young- after about a week- but for stronger tasting kraut. I hope you enjoy this easy seasonal recipe- send photos or recipe ideas if you feel inspired. Until then, happy fermentation and bon appetit!